Hemphill Bald in the Great Smoky Mountains makes a super scenic hike from Cataloochee Ranch or Purchase Knob in the Maggie Valley area. 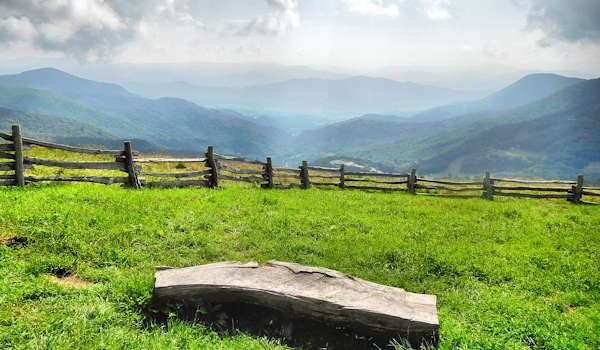 The grassy bald at 5,600 feet elevation provides sweeping views and epic picnic spots. While you can reach Hemphill Bald via a variety of hikes, our favorite option is hiking the 5-mile loop from Cataloochee Ranch (and timing it to end with a hearty meal at the ranch!). While the bald is privately owned by Cataloochee Ranch, the owners put it into a conservation easement to protect it forever. Any guest of the ranch can hike it. Visit for lunch or dinner - or stay the night. If you prefer to ride a horse to the top, the Ranch offers horseback riding trips in May-November. To begin your hike, park at the ranch (119 Ranch Drive, Maggie Valley). Check in at the front desk to get a free printed map. This scenic 5-mile loop begins at the ranch. Walk up Ski Lodge Road by the barn and horse pastures - heading toward the Cataloochee Ski area. After about a quarter of a mile, take a left onto Pine Tree Gap Road. Begin your gradual uphill climb through the forest (gaining about 800 feet in elevation). 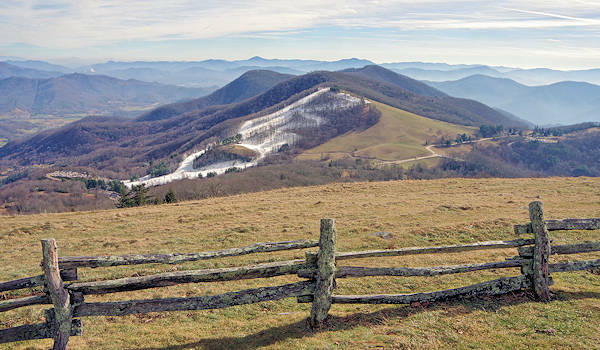 Follow the red arrows for Hemphill Bald, reaching pastureland for a final ascent up the bald. 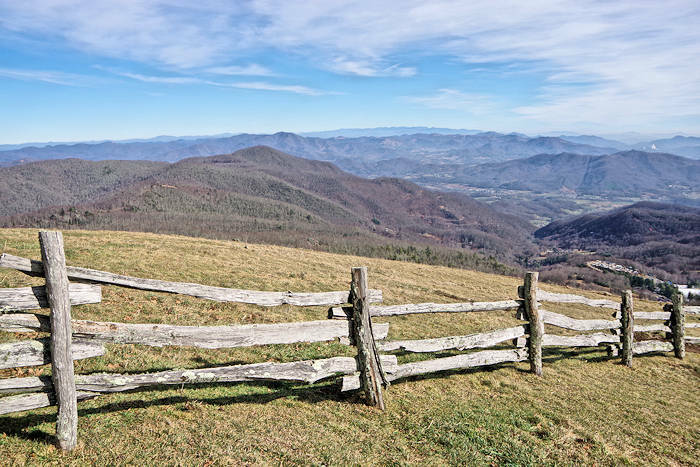 You'll walk parallel to a fence that marks the boundary to the Great Smoky Mountains National Park on your left. On the other side of the fence is the park's Hemphill Bald Trail with connects to many other trails. Winter hikes often provide the longest views with clear haze-free skies. You’ll see Cataloochee Ski area and the Ranch (on the right). At the summit, look for this marker that identifies the many summits in view - including Mt Mitchell and Cold Mountain. It's a memorial to Tom and Judy Alexander, founders of Cataloochee Ranch. Their descendants placed 220 acres into a conservation easement that ensures it will never be further developed. 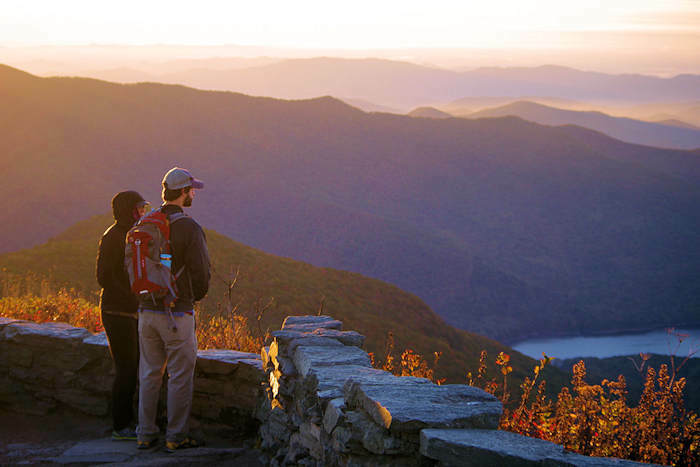 This easement is administered by the Southern Appalachian Highlands Conservancy. Near the plaque are some benches for soaking in the views. During our last summer visit, the temperature was 20 degrees cooler here than downtown Ashevile! During the warmer months, you'll share the bald with grazing cows. 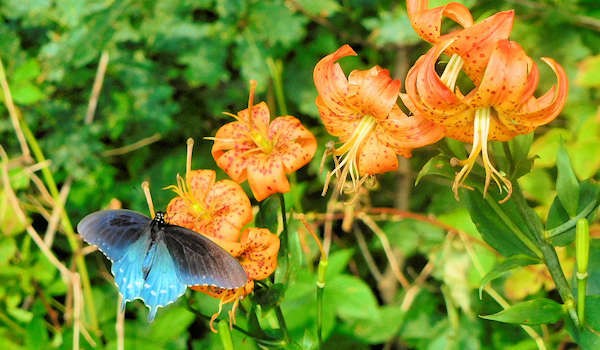 It's a fantastic place for wildflowers, including July blooming Turk's Cap Lilies blooming. After your rest break, continue down the bald and up to Thunderbolt Knob for another view. Just before the uphill section to the Knob, you’ll see the trail fork to the right and head down the ridge back to the ranch. This takes you down to Double Gap Road past some cascades. You'll come out on the Ski Lodge Road, taking a right to return to the Ranch. Expect cars on this section if the ski resort is open. 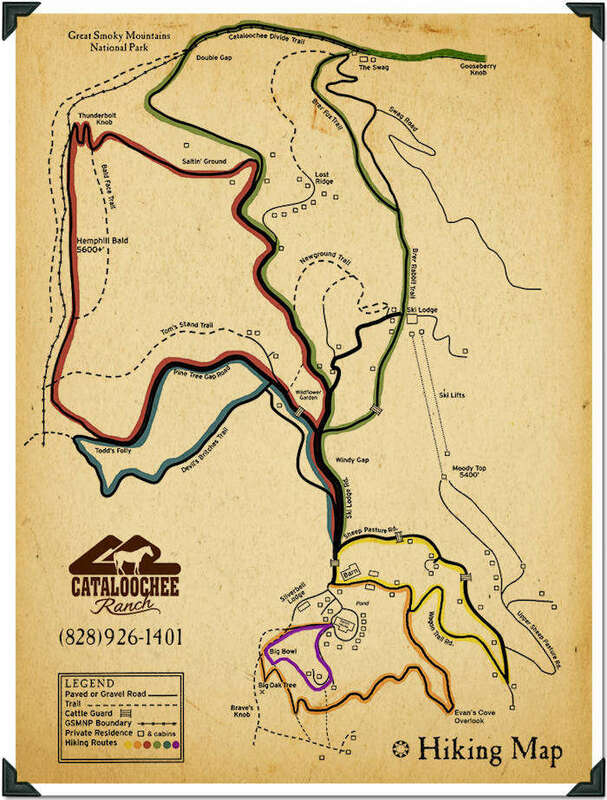 See the Ranch Hiking Trail Map. Read more about Cataloochee Ranch. 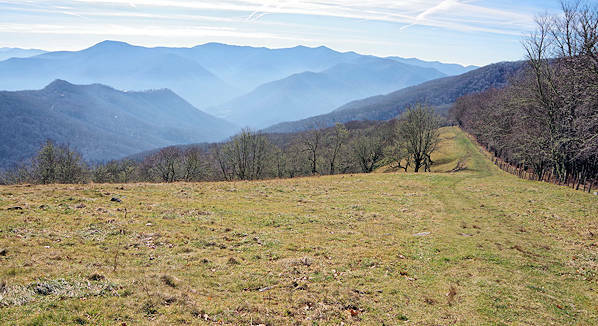 Since the network of trails at Cataloochee Ranch connects to the National Park trails, options for hike routes are endless. Other top scenic route (6.4 miles roundtrip) is to start at Purchase Knob and hike to Hemphill via the Cataloochee Divide Trail (with a stop at The Swag). 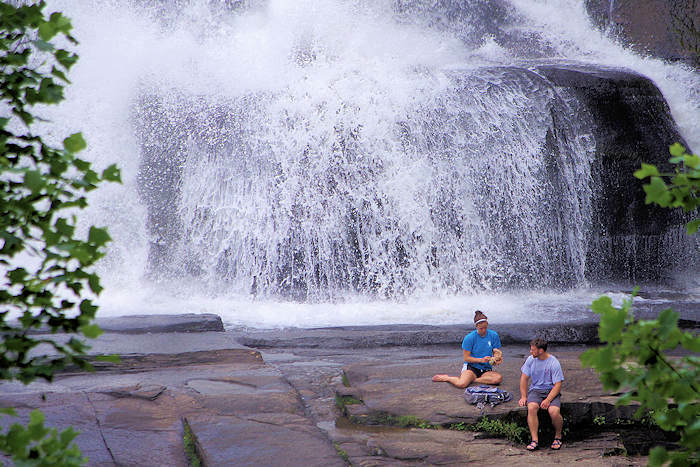 A local’s favorite is to start at Polls Gap on Heintooga Ridge Road, 7 miles off of the Blue Ridge Parkway (closed much of the winter). The trailhead for the Hemphill Bald Trail is at the Balsam Mountain Campground (about 5,200 ft elevations). Hike 4.7 miles to Hemphill Bald up and down several ridges. You can also create a 13.7 mile loop that incorporates the Caldwell Fork Trail. Cataloochee Ranch is about 39 miles from downtown Asheville. Maggie Valley is an easy drive on four-lane highways. The ranch is about 3 miles above the valley, so the last part of the drive is a very curvy and steep paved road.